It is that time of year again! Every spring/summer we make a pilgrimage to Germany to visit my husband’s family, and because I am so craftacular, I often make gifts (Not always, mind you) for my niece (9) and nephew (11). The past few years my nephew has been hard to shop or make things for. He is not too excited about much, Kelley special or not. Well, my Borussia Dortmund or BVB 09 (my nephew’s SOCCER team) scarf that I made him for Christmas was such a hit (incredible, right? 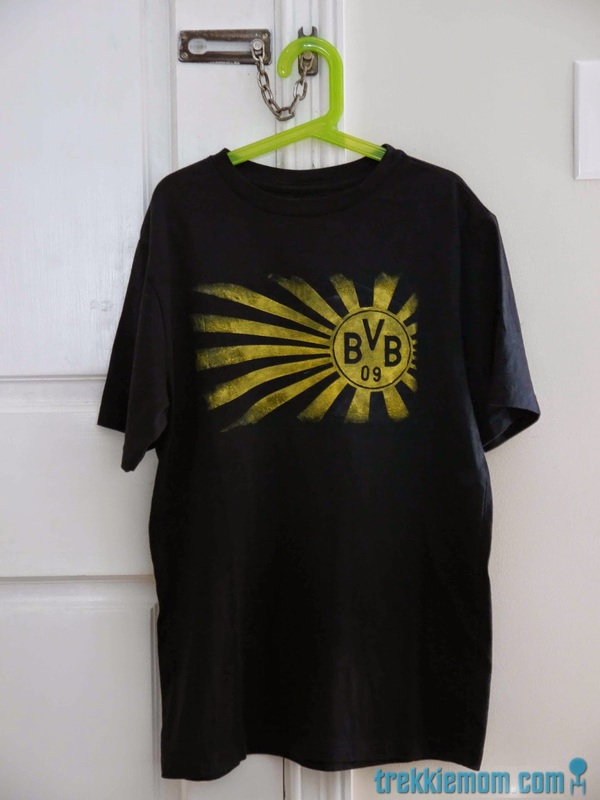 ), that I thought maybe a can’t-buy-this-anywhere-else BVB 09 t-shirt would be just the ticket. I have been scavenging Old Navy to get the cheapest T’s when there are sales, and I just so happened to have a large and extra-large black boy’s t-shirt. Remember, his team’s colors are black and yellow. What else did I need? I still had the 2 negative versions of the cool stencil that I had cut out for the BVB 09 scarf this winter. It was just a matter of ironing them into place. Well, it was a bit of a pain, but I managed. There were a lot of pieces. Firstly, I used a copy of the image that had cut up for the original stencil to place my pieces in the right place. Keep in mind that when I made this stencil originally, in order to not want to do myself harm, I cut out every 2 rays, i.e. each stenciled ray includes a black and a yellow ray. Phew, this stencil had me sweating putting it all together. Looking good, so far, and I had to do this twice: a large youth t-shirt and an extra-large youth t-shirt. I thought the large would work, but kids grow so quickly that I had no idea if he would still fit into the large. Now I had to add the yellow paint. However, unlike the other stencil, I didn't have any definitive end to this stencil, so I wondered how to finish it. Did I want to get out my yellow spray fabric paint? Did I want to try to get the perfect straight line at the end of the rays? If so, how would I accomplish that? Did I want to try to fade out the regular fabric paint before the stencil ended? I was afraid that the spray paint would get out of hand, spraying beyond the stencil and making it all look weird. Next, I decided that it would be unlikely that I would manage a perfect straight lines at 90 degree angles well enough that it would look good. So, my final decision was to try and fade out the paint before the stencil ended. It doesn't look too impressive at this stage does it? I only used one coat of paint, since I figured that as the paint aged with washing and usage, it would not look as worn as it would if there was a really solid yellow that cracked. It was now the moment of truth. To be honest, I was still worried about good this would look at this point. I'd call that a Volltreffer (German for bull's eye). I sure liked it, and at least my nephew seemed to like it! hi kelley! i have always wanted to try fabric paint, now you just gave me the perfect tutorial!! the shirt looks awesome - love the contrast of the natural and cut edges!! I say dive in, Ananda! It isn't a very expensive adventure to try. 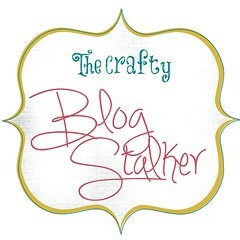 That is one reason why I took the plunge after seeing several posts on other blogs. Just buy some garden variety freezer paper from your grocery store, a color or two of fabric paint, just about any image from the internet and something (t-shirt - whatever) you want to paint. My Star Wars t-shirt post links back to the tutorial that I originally used for my first dip in the fabric paint/freezer paper pool. I hope you enjoy it as much as I do.